Opie Oils stock a large range of Pipercross filters, one of them being their famous Pipercross Venom Air Intake Kits. The double-conical filter gives the New Pipercross Venom the largest surface area of any after-market enclosed intake system of this type available today. Increased maximum air flow and low restriction for any given volume of air flow and increased dust capacity means less servicing is required. For more than 40 years, Lescot has designed, manufactured, and distributed maintenance products. Lescot has drawn on the best of its expertise and know-how, so you can take advantage of carefully selected formulas fulfilling the requirements of car care. Whatever you need to get your vehicle ready for summer and clear that winter grime, Opie Oils will have the Lescot product for you. Laser offer a full range of traditional high quality hand tools but are also well known for their ever increasing range of specialist tools designed to make easy work of difficult and awkward jobs. These tools are the result of feedback from the sharp end of the automotive industry – the actual technicians working on today’s motor cars. When a problem is identified on specific vehicles, the Laser engineers devise a solution that is both cost effective as well as making the job easier for the technician – usually meaning that the work can be carried out on the vehicle in situ – rather than removing sub-assemblies and then removing and replacing the faulty component on the workshop bench. Opie Oils stocks an extensive range of Laser products, all at great prices available to purchase online today. Opie Oils have added TWO NEW MOMO steering wheels to their range of MOMO. MOMO Dark Fighter Steering Wheel which has been feature in the Months Banzai & MOMO Dark Fighter Wood Steering Wheel. The Shell Helix range of motor oil is backed up by extensive oil-development know-how built up from years of experience. No matter how stressful your driving conditions, there is a Shell Helix oil designed to meet your motoring challenge. So, when the opportunity to increase our range with some of their more specific oils aimed at meeting the most recent diesel specifications came along, we jumped at it! Shell Helix Ultra Professional AF 5w-30: For the technically challenging in-house Ford engine oil specification WSS-M2C-913 D, as well as various Jaguar and Land Rover approvals. Shell Helix Ultra SN 0w-20: Designed from the ground up to actively keep engines clean, thanks to the unique Shell PurePlus Technology. Shell Helix Ultra ECT C3 5w-30: Includes an array of approvals, all of which are designed to keep diesel particulate filters clean, maintaining engine performance and fuel economy. Shell Helix Ultra ECT C2/C3 0w-30: This is the latest in Shell’s high quality range of fully synthetic motor oils – keeps even the most modern diesel and petrol engines clean. Shell Helix Ultra Professional AF 5w-20: Formulated specifically for use in Ford vehicles with the “Ecoboost” engine, also backwards compatible with the majority of Ford petrol engines. Shell Helix HX5 15w-40: This works continuously to prevent dirt and sludge build-up and reduce engine noise. Shell Helix Ultra Professional AM-L 5w-30: Designed to meet the demanding requirements of particular high performance engines, including BMW and Mercedes-Benz, and those requiring API SN/CF or ACEA C3. Shell Helix Ultra Professional AR-L 5w-30: Perfect for high performance diesel engines, including Renaults and those requiring ACEA C4 specifications. Shell Helix Ultra Professional AP-L 5w-30: Specifically for the use in modern Fiat, Citroen and Peugeot diesel engines using diesel particulate filter technology. Shell Helix HX7 Professional AV 5w-30: Ideal for Audi and VW, and those requiring ACEA C3. See also Shell Helix Ultra Professional AV-L 5w-30. Shell Helix HX7 5w-40: Helps to keep engines clean and running efficiently by helping to prevent the formation of sludge and engine deposits. It is suitable for a wide variety of modern vehicles driven in demanding traffic conditions. Shell Helix HX7 ECT 5w-40 C3: Features emission-compatible technology that helps to keep diesel particulate filters clean to help maintain engine performance. It helps to minimise the formation of sludge and deposits. Shell Helix D Ultra AB-L 5w-30: The lastest fully synthetic engine oil deisgned specifically to meet the needs of all Mercedes-Benz diesel engines, including those with diesel particulate filters. If you fancy a look at the entire Shell Helix range, simply click HERE. 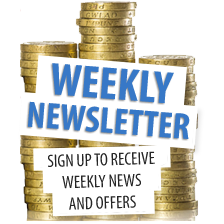 Don’t forget, if there is anything else you need, just give us a call on 01209 202 944 Monday to Friday 8:30-5:30 or drop us an email to sales@opieoils.co.uk and we’ll be happy to help! 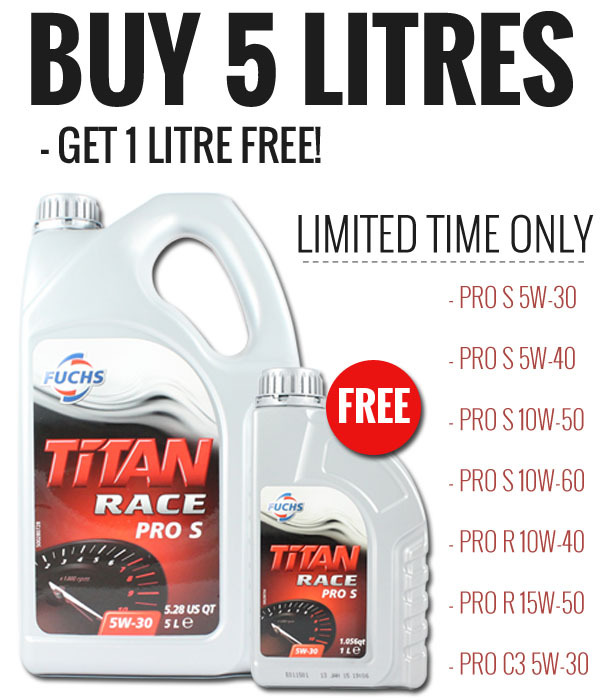 Fuchs Titan Race – buy 5L, get 1L free! Opie Oils are pleased to announce that we’re currently running our very popular Fuchs Titan Race Pro offer – FREE 1 LITRE with every 5 litre of Fuchs Titan Race Pro S 5w-30, 5w-40, 10w-50, 10w-60, Pro R 10w-40, 15w-50 and Pro C3 5w-30. Just a quick heads up – there’s been a few additions to our Mahle range of filters, including air filters and oil filters designed to fit some of the more specific vehicles including various motorbikes. Jilong manufacture a range of quality electric and manual pumps, suitable for a multitude of tasks. At Opie Oils, we have a great selection of manual and electric pumps which are perfect for outdoor use. Ideal for inflating boats, lilos, balls, toys, tyres, beds – anything that needs air! These pumps can run from your house mains, from you car’s cigarette lighter or from old-fashioned leg-work. Kent Chamois Company Ltd produce the Kent Car Care range of products, which is one of the largest ranges of Automotive Valeting products available in the UK. At Opie Oils, we stock a huge range of their very popular items, from your basic every day items such as microfibre cloths and wash buckets, to high powered machine polishers.